A bricks and mortar store at last! Le Collier! Whilst we like having our beers delivered to our homes cold and safely packaged up on a Saturday morning, once in a while, we do have to venture outside to find some places that sell beers, and we don’t mean a convini either. BeerTengoku does not live in Tokyo; however, if we did, then we would want to live within walking distance, or at least have a teiki, a monthly train pass, that allows us to pass through Tokyo station. 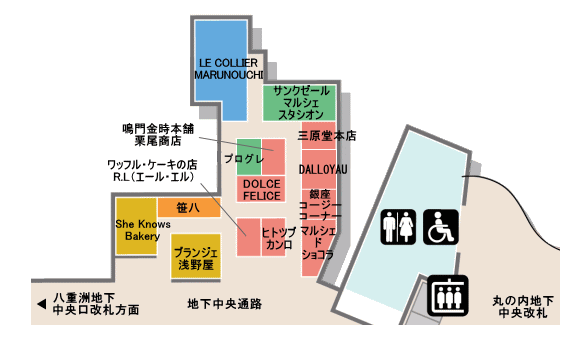 Le Collier is located INSIDE the ticket barriers at Tokyo station, in a vast, maze like shopping area called GranSta. It is a pain to find. You’ll probably get lost or walk around in circles for hours on end trying to find this place, but remember, it’s on B1 near the Marunouchi side and you should be in roughly the right area. 100+ beers at your selection. Le Collier predominantly sells Japanese craft beer and what a selection it has. One of the things about Japan I love is that you can usually find some craft beers from the region you are visiting at the nearest train station. For example, on a trip to the Baird Brewery, BeerTengoku managed to find three different local breweries at Shuzenji station. Le Collier is like that except with beers from all over Japan. With a varied selection of regular craft beers, and also seasonal ones, you can easily come out with something new. With prices ranging from ¥280 to ¥600, large craft beer breweries such as Minoh, Baird Beer, Hitachnio Nest, and Oh! La! Ho! are nestled against smaller ones such as Brimmer Brewing, Kamakura Beer, Shonan Beer, and also Helios among others. BeerTengoku counted over 100, that’s right one hundred, different beers before we gave up and went to the tasting station. Le Collier also hosts a tasting counter with 4 taps of Japanese craft beer that change around, giving you the chance to have a quick beer while waiting for, or forgetting in my case, the train home. Prices start from ¥500 yen for a large glass, roughly 330ml, and the beers are usually found in the refrigerated units next to the bar. BeerTengoku will definitely be buying some of its beers from here when we pass through Tokyo station. Heck, even if we don’t, we will be making an excuse to come here and try some more of the beers. Le Collier is situated near the underground Marunouchi central exit on B1, and can be easily found if you are going towards the Yokosuka Line platform from the central stairs of the other JR lines.